My work has always been more about invitation than instruction or direction. Engaging with sound in a mindful way has been the single most empowering aspect of my life. I believe in its transformative powers and have been inspired and committed to finding ways extend this experience to others. Join composer and sound artist Brenda Hutchinson for a special reception as we welcome her works into the window gallery of C4NM. 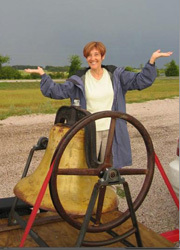 Hutchinson will share her thoughts with interviewer Bart Hopkin, and demonstrate selected instruments from her exhibit. Brenda Hutchinson was born in Trenton, New Jersey in 1954. She is a composer and sound artist whose work is based on the cultivation and encouragement of openness in her own life and in those she works with. Hutchinson encourages participants to experiment with sound, share stories, and make music. She has spent the past 2 decades singing into a 9 1/2 foot tube and has designed a gestural interface for the Long Tube and MAX/MSP. Recently, Brenda has been developing a sound initiated drawing interface and assistive device to work with memory and cognitive impairment. She is also Groucho Parx, a member of the Avatar Orchestra Metaverse in Second Life. Originally made for the Exploratorium, the Giant Music Box is an instrument/interactive exhibit that anyone can use to make music. It was my response to the challenge of creating an instrument and situation where people could play alone or with others and create something that “sounded good”. I have always loved the sound of those little music boxes and thought it would be wonderful to extend that private experience to a shared opportunity for music making. While the Giant Music box is obviously an object created expressly for making music, the Long Tube became an instrument in the same way that a bucket or pair of sticks or any found object is transformed by the way it is played. 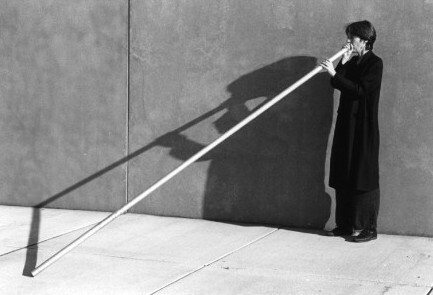 The particular beauty of the Long Tube as a found object instrument is that it is interactive. The Long Tube is bionic and if you sing into it, something interesting will happen. Part of the reason I perform with the Long Tube is to inspire other people to try because it is so simple and immediately rewarding as a musical instrument. 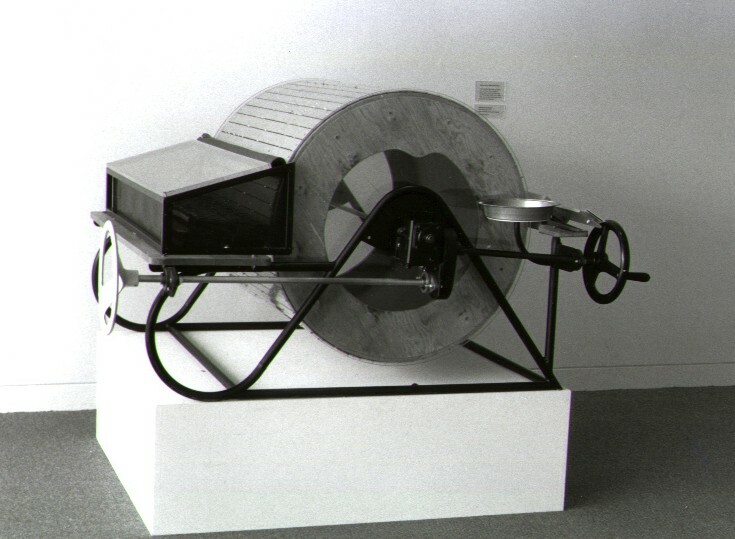 Eventually my curiosity with expanding the sonic and interactive possibilities of the Long Tube overpowered my desire to demonstrate its egalitarian nature, and I developed a gestural interface to work with the computer and live performance. Hutchinson has presented her work at international festivals in New Zealand, Europe, Latin America and Canada. Venues in the United States include the Lincoln Center, Merkin Concert Hall and The Kitchen in New York and New Langton Arts, The Lab and The Exploratorium in San Francisco. She has produced work for National Public Radio’s Soundprint and is the recipient of: Gracie Allen Award from American Women in Radio and Television, Ucross Residency Award and Montalvo Artist Residency. She has received commissions from the Mary Flagler Cary Charitable Trust, Meet the Composer/Reader’s Digest, National Endowment for the Arts, and McKnight Foundation, among others. Brenda has been an artist in residence at San Quentin Prison, Headlands Center for the Arts, Harvestworks, The Exploratorium and Djerassi Resident Artists Program. Recordings of her work are available through TELLUS, DEEP LISTENING, THE AERIAL, O.O. DISCS, FROG PEAK MUSIC and Leonardo Music Magazine.